These days, it seems everyone from your neighbor to the U.S. president is using Twitter, the hugely popular online social network. It's a jungle out there in the Twitterverse and getting to know the terminology is important if you're going to use the platform. Here's a quick guide to what's meant by "following" on Twitter. Following someone on Twitter simply means subscribing to their tweets or messages so that you can receive them and read them in your feed. 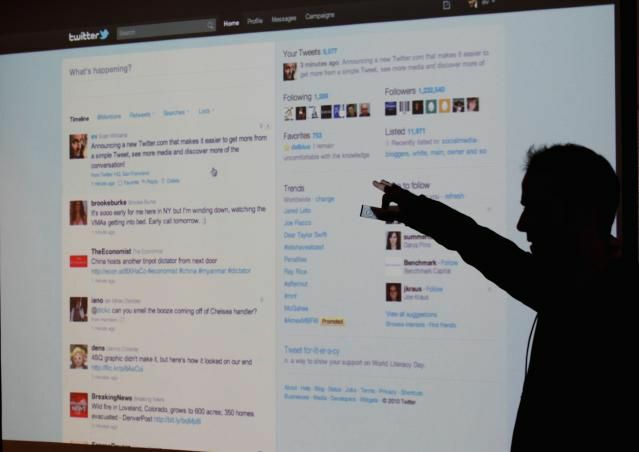 If you want to know what a particular user is tweeting in real time, you follow that person. Then, whenever you log into Twitter, their comments will show up in your feed, along with those of others you've chosen to follow. Following someone also means that you have granted the person you follow permission to send you private tweets, which are called "direct messages" on Twitter. As you might surmise, Twitter followers are the people who follow or subscribe to another person's tweets. Your followers, for example, will see whatever you tweet in their feeds. If you're a follower of PersonX, you'll see PersonX's tweets in your feed (and receive notifications when they occur, if you choose). Although the traditional meaning of "follower" includes an aspect of allegiance or support for a person, doctrine, or cause, Twitter has added a new dimension to the term. In today's parlance, a follower is simply anyone who has clicked the Twitter Follow button to subscribe to another user's message. It doesn't necessarily indicate agreement with or support of the person followed—only that the follower wishes to keep up with what the person is posting. Variations on the term "Follower"
Many slang words for Twitter followers have come into use. These include "tweeps" (a mashup of "tweet" and "peeps") and "tweeples" (a mashup of "tweet" and "people"). Following is a public activity on Twitter, which means that, unless a user has taken their Twitter timeline private, everyone can see who they are following and who is following them. To check out who a user is following, go to their Twitter profile page and click the Following tab. To view who has subscribed to that person's tweets, click the Followers tab on their profile page. The big difference between "following" on Twitter and "friending" on Facebook is that Twitter following is not necessarily mutual—meaning that the people you follow on Twitter don't have to follow you back for you to subscribe to and see their tweets. On Facebook, the friend connection must be reciprocal if you're to receive anyone's Facebook status updates. Twitter's Help Center offers more details about Twitter followers and how following works on the social messaging service; it's always available from the right-hand side of your computer screen; to find it on your phone, swipe from left to right to bring up the menu on which you'll find the link. Likewise, the Twitter Language guide offers many more definitions of Twitter terms and phrases.